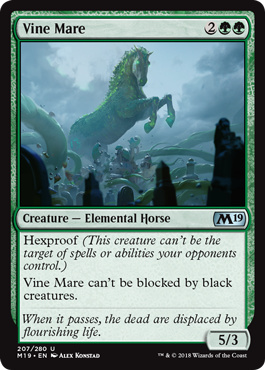 Vine Mare is part of a cycle of horses in M19, one for each color plus the artifact Diamond Mare. I feel like there was a meme on the internet about horse cards in Magic a few years ago, so the cycle might be a reference to that; alternatively, they could also have come at a fortuitous time to interact with Hour of Devastation‘s Crested Sunmare and provide a deckbuilding caution alongside Unstable‘s Ordinary Pony. Vine Mare is actually pretty strong even without horse tribal cards, as hexproof mitigates her relatively low toughness and five power is enough to threaten any opponent, even before she becomes unblockable against Dread Shade decks. In midrange matchups, Vine Mare will start to feel a little fragile as you enter the midgame, but she is the sort of threat that opponents relying on smaller creatures can struggle to handle. The elemental Horse cycle is a simple enough cycle: each color gets a Horse unblockable by one enemy color and has a relevant ability. Vine Mare has hexproof, and that’s pretty legit; a 5/3 for 4 is about what you’d hope for stat-wise, particularly with protection, and it’s a beating against black decks (forcing them to rely on artifact creatures or global effects to take it out). It’s a niche creature, but it could do work if black is relevant in this Standard.